The weather just kept getting better and better, so we spent a lot of time outside this weekend. Alex's brother and sister-in-law visited, and they specifically asked if we could go canoeing on the run while they were here. Could you ask for better house guests? So, we spent a good chunk of yesterday outside on the river, and then this morning we took them to Leu Gardens where we wandered around in the beauty. Both mornings I had a little time to work in the yard before anyone was ready to get moving, and this morning I took a walk through the neighborhood a Mead Gardens - our local park. I've particularly enjoyed my own yard, though I haven't taken many photos. I usually don't do my spring clean up until I'm too late to get a good start for the season, but I was right on it this year for whatever reason. So, I get to go to the nursery after work this week - the one good thing about this early daylight savings time. My garden is finally really established, so the plants are already have are looking...boisterous comes to mind. 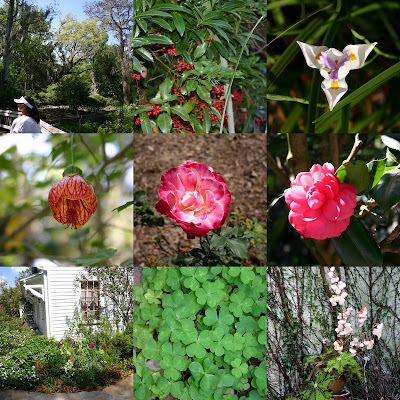 So, for your viewing pleasure, a (small) selection of photos from my garden, the morning neighborhood walk, and the botanical gardens. Happy Spring! From top left: Lake front at Leu Gardens, berries in Mead Gardens, my neighbor's Iris, Leu Garden's balloon plant (is that right? ), Leu Gardens rose, Leu Gardens camellia, Butterfly garden at Leu Gardens, a patch of my volunteer clover, my begonia (started from Grandma's). oh sure, brag about can keep flowers alive. This year I'm just hoping my rosemary makes a comeback. I love rosemary...hardly any work and super hardy and goes in any food.